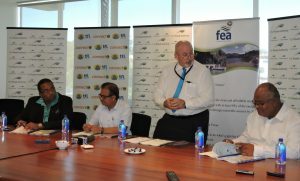 The Fiji Roads Authority signed the Code of Practice for Utility Operators’ Access to Road Corridors with Telecom Fiji Limited, Water Authority of Fiji and Fiji Electricity Authority. This Code of Practice COP defines mutual agreed objectives and requirements aligned with coordinated approach between the FRA and utility operators. This code sets utility operators and other applicants to exercise their right of access to the Road Corridor for the placement, maintenance , improvement and removal of utility structures. This COP will also maximize the benefit to the public while ensuring that all utility operators are treated fairly. The FRA will have regular meetings with the stakeholders to share information, discuss, and plan activities including mandatory attendance and reporting to the Project Coordination and Planning Committee.